Let's face it most of us are switching to smart phones because they are a great way to stay connected. If you own Fast Lube or other automotive shop being easily available to your customer is important. "Smartphones have become the super tool for moms on the go," said Dane Holewinski, Director of Marketing with Greystripe. "The majority of moms with smartphones are using those devices for their day to day tasks especially shopping, making them the ideal target for advertisers." The Greystripe report surveyed more than 230 women with children using iPhone and iPod Touch devices as well as Androids. Those surveyed were in the Greystripe network. Overall more than 234 million Americans are in the mobile space with most either texting or using mobile browsers to connect. Consumers are also downloading apps (37%) and accessing social networks (27%) and playing games (25%). What message is your shop sending? A recent study finds that nearly half of moms (45%) are using smartdevices to find store locations and 36% are using them for price comparisons. The Oil Change app is a great way to help customers find you, connect with them and put your store in their minds when making a decision of where to get their preventative maintenance done. 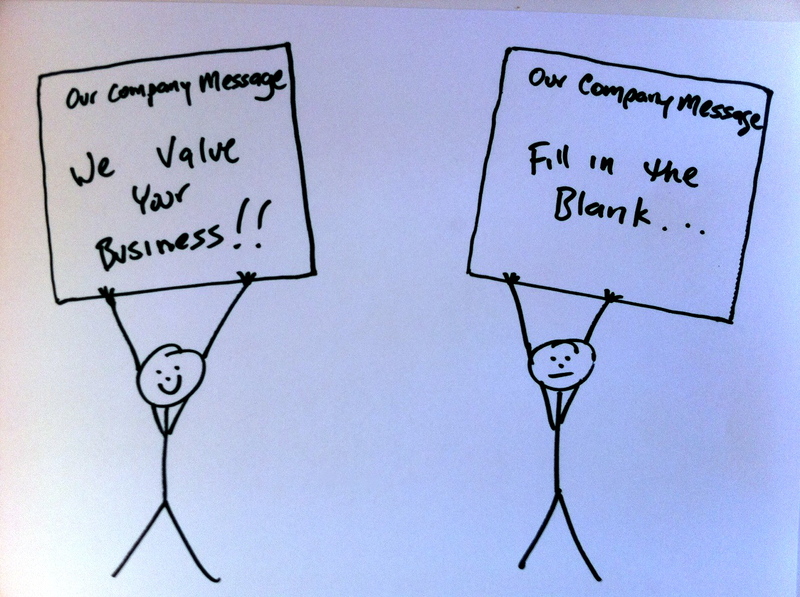 Connecting with the customer can be tricky if you do not know what to say or how to put your message across. This installment is to help you build that message and set your shop page up to get the best results. Understanding the features and how the app works is very important so please take just a minute to walk through how it works and how the customer uses the app. Here's a link to find out more. The free version of the app will allow you to list your shop and set a price and shop logo on you shop page. The logo should be saved as a .png file and under 1mb to load correctly, if your having problem send it to me and I'll upload it for you. A Super Shop listing is the absolute best way to get customers to take you seriously on the app. We have real time analytics to show you what the customer is responding to, you can see which locations are getting traffic and which are not. Use your shop logo's to stand out and speak to them on the features and offer text box and offer discount coupon's and speak to them again in the coupon details text box. 1. The first thing that most shop owners see is the shop logo on the map, list and shop page and these are great was to help you stand out but don't forget the affiliate logo. This is the one that sits in the middle of the shop page and can communicate the type of oil your store uses, trade affiliation like the American Oil Change Association or ASE. If you don't see a logo and would like it added send me an email and the logo you would like set and I will include it. BUT... this is not the most important item to connect with customers. 2. The way to really speak to your customer is in the Features and Offers text box located on your shop page. 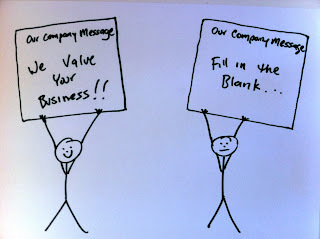 This is the opportunity to actually say something to your customers, in your own voice, that tells them what to focus on. Tell them about your commitment to quality, lowest price, the offer you want to give them to come to your store, your message "we are the best", the cheapest, the fastest, the shop with the most training, the shop with the most locations, shuttle service, the shop with the highest customer service ratings! This in my opinion is one of the most important ways to tell the customer why they should chose your location. We have had shops upload a pink version of the logo to celebrate Cancer awareness or other charity events. 3. Coupon is a good thing! You don't have to be the lowest always to get people to look at your shop page. This is another way for you to talk to the customer. Give them more details about your offer or about your store and the advantages of coming to you for service. 4. Coupon code, this is something people expect to see and can be another touch point and be a fun way to get your customer involved. If you chose not to use a coupon code the phone will default to "Shop Your Phone". 5. Don't keep the app a secret! Would you rather tell your customers about your store listing and how it can make their service easier with a reminder or let them find out on their own and start shopping? Tell your existing customers about your listing with In-store marketing materials we have for you. Contact me and I'll send them to you free! When customers think of an oil change, do they think of your shop first? When customers think of their next oil change, do they think of you first? Allow customers to set their own service reminders to come back to YOUR STORE! 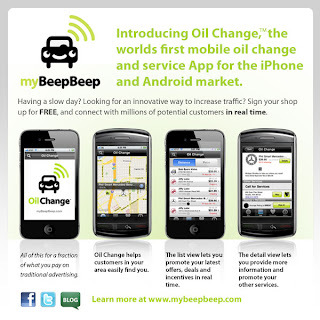 Visit www.mybeepbeep.com to register your store. 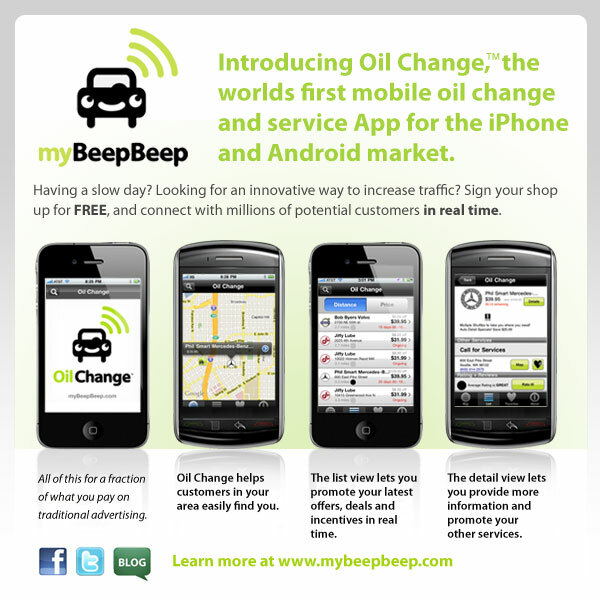 Call us at 866.987.9911 or e-mail us at info@mybeepbeep.com for more information.